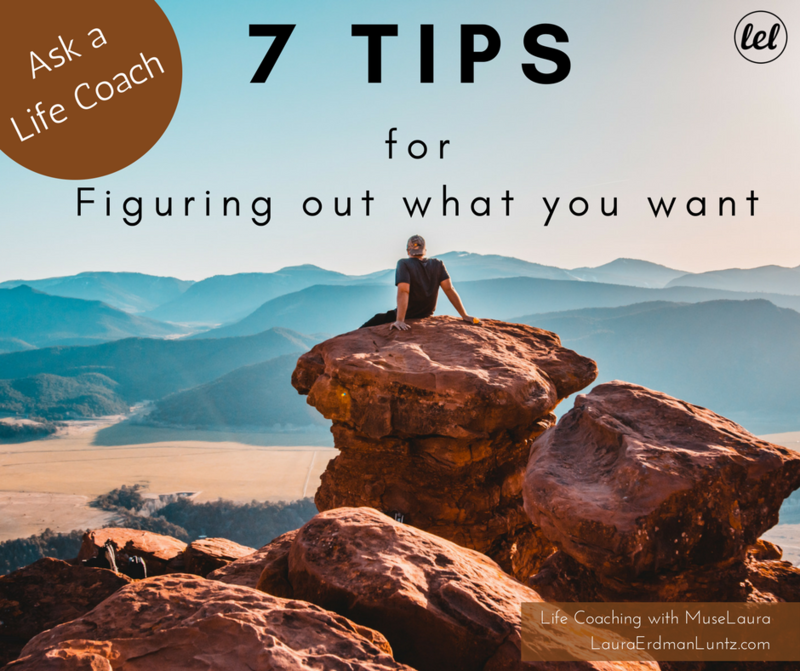 Life Coaching: How do you Figure out what You Want? One of the biggest challenges for my clients is helping them to figure out what they really want. Usually they have a bevy of things they don’t want, but to get clear, really clear, on what they really want, can be hard. We also cut ourselves off from desiring because it is too materialistic or not grounded or not nice or whatever! BUT I once read (and I LOVE this!) the word desire comes from “de sire” or “from the Father”, it is a desire your soul has to get your closer to your purpose here in the world. BUT if you have been cutting yourself off from your dreams for years (even decades) you are more removed from what you really want and your dreams may show up in weird ways. There is a fabulous story from another coach about a man who’s life’s purpose was to be a world famous metal sculptor. When he started working with his coach, his only mental access to what he really wanted was desiring to own a sport’s car. He judged this desire as superficial for years. It wasn’t until his very talented coach supported him and said go for it that he investigated it. He didn’t go out and buy it, he simply thought, “Hmmm…why do I want it?” and took a test drive. He realized that wasn’t it, but he kept investigating. Through a bit of trial and error, he finally got to the sculpting. He is now a world famous metal sculptor. It isn’t until we investigate what we want with love and attention rather than judgment that we can figure out what we truly desire. That being said, how can you figure it out? Begin right now by honoring what you want. There is no room for judgment here. Just let whatever comes up be a fascinating experiment. Set aside a day for doing this work – or at least a solid chunk of time. You want to create enough space for yourself that you are able to see the bigger picture of your life. Sit down someplace beautiful all by yourself with a favorite pen and journal. Have a glass of wine. One glass of wine can help take down some of the limitations you have erected. Be sure it isn’t two — that usually begins a negative path. If you choose not to drink alchohol, choose a lovely, calming tea. Then dream. If you could have anything, and I mean anything, what do you really want? Who do you envy? Why? Is it their home, their lifestyle, their work? What is it about them that you want? Add it to your list. Finally, imagine yourself on your death bed. You have a smile on your face because all you can think of is, “That was a life well lived.” What would make you smile like that! One last thought: As your Life Coach :-), I guarantee you aren’t done! No matter what you came up with this first round, it is not big enough. Really. No one dreams big enough the first time around. Want more ideas? Like how to figure out what you really, really, really, really want? Check out this post: What do you really, really, really, really want? Revisit your dream regularly. The more you stretch your life, the more you will know you are capable of creating. Then go for it! Work toward this life you are imagining! 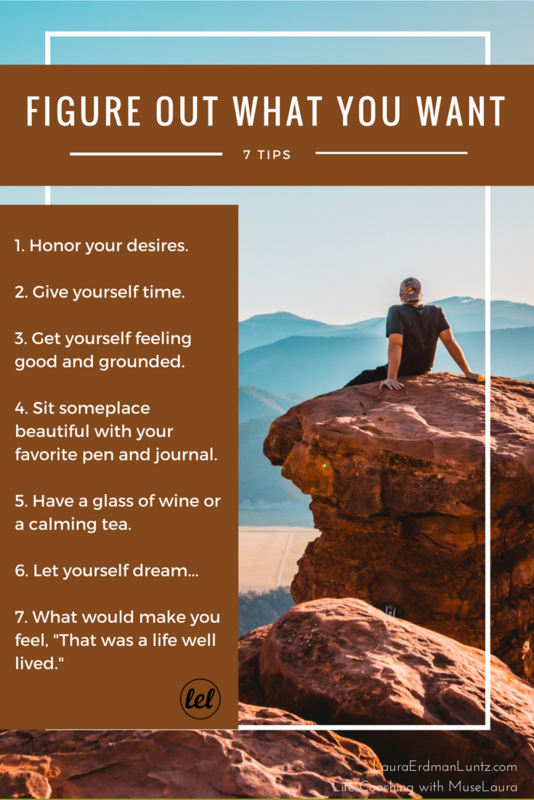 Want to learn more about Life Coaching with MuseLaura? Such a great message! “We have cut off our ability to desire.” So true. And being “realistic” is overrated!